< PREVIOUS And the 10 Worst Shoes for your Feet are... drumroll... | article | NEXT >The 10 Worst Shoes for your Feet... Part 2! Ryan Zimmerman of the Washington Nationals, started complaining of symptoms of plantar fasciitis in his left foot about 10 days ago. You could catch the normally quite nimble first baseman hobbling from base-to-base in a game against the St. Louis Cardinals. Corey Dickerson, left fielder for the Colorado Rockies, benched himself in the third inning of the game against the San Diego Padres. Dickerson has been dealing with a mild case of plantar fasciitis in his left foot for a while now, but given his performance against the Rockies, it looks like he might need to seek out professional plantar fasciitis treatment. Plantar fasciitis is a very common condition in the United States, causing pain and discomfort for many, but especially athletes who stress out their feet for a living. The plantar fascia is the thick band of soft tissue running along the bottom of the foot, supporting the arch and connecting the heel to the toes. The repeated pounding and irregular body mechanics required of many athletes can lead to tension in the plantar fascia, causing inflammation and then, if not treated properly, a chronic condition. The inflammation feels like a sharp, stabbing pain in the heel of the foot. People suffering from plantar fasciitis feel the most intense pain after long periods of rest, like when climbing out of bed in the morning or getting moving after standing or sitting in the dugout (or an office chair for us non-pros) for a while. 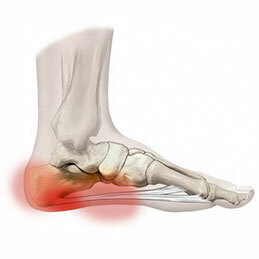 The initial pain will usually subside after the foot flexes and warms up a little bit. Aside from excessive exercise, excessive weight and unsupportive footwear can also contribute to plantar fasciitis. 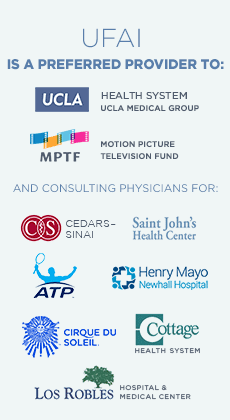 Treatment options are available for sports players and fans alike. Check out these three plantar fasciitis treatment options that sound more like science fiction than actual medicine, but they are time tested treatment options that we have been using for years! Stem cell research has gotten a lot of controversial press in the past, but stem cell therapy’s incredible regenerative powers are undeniable! The procedure is non-invasive and almost entirely pain-free. Your doctor will collect stem cells by taking a blood sample from your own body. After the unhelpful cells are filtered out, your doctor re-injects the stem cells into your plantar fascia, where they instantly start to multiply, restoring tissue and relieving pain. Don’t believe it? Just ask Kobe Bryant of the LA Lakers, who recently underwent stem cell therapy for an Achilles tendon tear! Your medical team at the University Foot and Ankle Institute are one of the only providers in the Western U.S. that offers both high-intensity and low-intensity Extracorporeal Shockwave Therapy. In this 15-minute procedure, a specially-designed hand instrument focuses shockwaves directly into the plantar fascia. The shockwaves produce what the experts call “micro-traumas,” meaning they shake up your tissue just enough to kick start the natural healing process. Increased blood supplied to the heel of the foot will break up damaged and calcified tissue. As nutrients being to flow freely into the area, the plantar fascia is ready to heal itself. Most treatment plans call for three appointments over three weeks. Many athletes have already experienced the healing powers of platelet rich plasma regenerative therapy. Similar to stem cell therapy, this therapy works by drawing your body’s own blood, filtering out most types of cells, and re-injecting the plasma at the site of the injury. What’s different about PRP? Instead of stem cells, the plasma will be densely packed with cells called platelets. The body has a 3-6 month window in which it tries to heal injuries; when the window closes, the body “gives up,” regardless of whether or not the injury has healed completely. This type of therapy injects the plantar fascia with the platelet-rich plasma that your body produces to alert itself that there is an injury that needs attention. This ensures that your body continues to heal itself beyond its normal healing window. The most important thing when dealing with plantar fasciitis is to actually deal with it and not ignore it or hope it will go away as if by magic. Short of you coming across some plantar fairy who will heal you with her magical dust, there are things you can try on your own at the first sign of symptoms such as icing and stretching. Check out this page on our site to learn more about these at home treatments that have a far higher success rate than fairy dust. If you would like more information on plantar fasciitis treatment options, please call us at (877) 989-9110 or visit us at www.footankleinstitute.com. Next: The 10 Worst Shoes for your Feet… Part 2!